Vitamin D3 Lotion contains cholecalciferol a form of Vitamin D that readily penetrates the outer layer of your skin, nourishing dry areas by helping to lock in moisture before its lost. 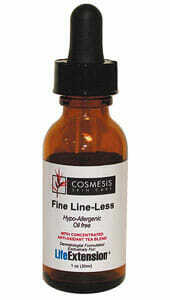 Helps rough patches, dry spots, and areas of tough-looking skin. Purchasing this product today earns you 27 DR Reward Points! Renowned dermatologist Gary Goldfaden, M.D., has developed novel solutions for the most common skin problems encountered by maturing adults. Based on extensive clinical testing, these formulas are designed with potent antioxidants tea extracts (red, green, and white) to correct specific areas of concern, such as the appearance of darkness and puffiness under the eyes, fine lines, rough skin, loose skin, and more.80-87 These products can be used in conjunction with any other skin treatments or products. They are specially formulated exclusively for Life Extension. Now you can replenish these areas and preserve your skin’s youthful radiance with Vitamin D Lotion. This cutting-edge formula supplies rejuvenating factors directly to aging skin to maintain its healthy-looking, natural glow. Vitamin D Lotion contains a highly absorbable form of vitamin D3 called cholecalciferol.127 It readily penetrates the outer layer of your skin, nourishing dry areas by helping to lock in moisture before it’s lost. 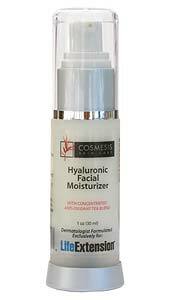 This helps to offset the visible impact of your skin’s gradually declining ability to renew itself. Because of its quenching action, this active nutrient also helps with rough patches, dry spots, and areas of tough-looking skin that result from dehydration, cold weather, irritating fabric, or repeated friction and pressure. Upper arms, elbows, knees, hands, and extremities are especially susceptible. Applying Vitamin D Lotion helps to restore their natural appearance. 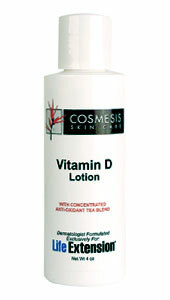 Use Vitamin D Lotion wherever it’s needed, for a radiant complexion and soft, supple skin. Ingredients: Purified Water (Aqua), Squalane, Hyaluronic Acid, Glycerin, Polyacrylate-13, Polyisobutene, Polysorbate 20, Cholecalciferol (Vitamin D3), Concentrated Tea Blend Extract, Anthemis Nobilis (Chamomile) Extract, Phenoxyethanol, Ethylhexlglycerin. Apply to clean skin twice a day. Rub in well. If pregnant, nursing, or taking medication, consult your physician before taking this product. 80. Free Radic Res. 2002 Apr;36(4):471-7. 81. Photodermatol Photoimmunol Photomed. 2007 Feb;23(1):48-56. 82. Cancer Lett. 2005 Jun 28;224(2):193-202. Epub 2004 Dec 10. 83. Biogerontology. 2007 Apr;8(2):97-109. Epub 2006 Sep 23. 84. Skin Therapy Lett. 2008 Sep;13(7):5-9. 85. Am J Chin Med. 2005;33(4):535-46. 86. Int J Vitam Nutr Res. 2003 Nov;73(6):453-60. 87. J Am Acad Dermatol. 2003 Jan;48(1):1-19; quiz 20-2. 125. Journal of Investigative Dermatology (1980) 74, 13–16. 126. Int J Biol Sci. 2008 Feb 19;4(2):63-70. 127. C Liébecq, ed. Biochemical Nomenclature and Related Documents. 2nd ed. Portland Press; 1992:242-6. 128. Curr Drug Targets Immune Endocr Metabol Disord. 2003 Sep;3(3):234-42. 129. Arch Pharm Res. 2005 Jul;28(7):784-90. 130. Photomed Laser Surg. 2009 Dec;27(6):969-71.